I wanted a simple indicator so we could quickly see the charging cable was plugged in or not , without having to go out to the garage. While the phone app works great, the phone is often charging and not quickly available while I’m in my house. With my charge cable indicator, it tells me at a glance if the cable is off it’s hook, and likely connected. As a bonus, it keeps the cable coiled nicely and holds the connector end when not in use. The display fits in a standard decora switch/outlet box. The mobile charger is on-hook, and not attached to the car. 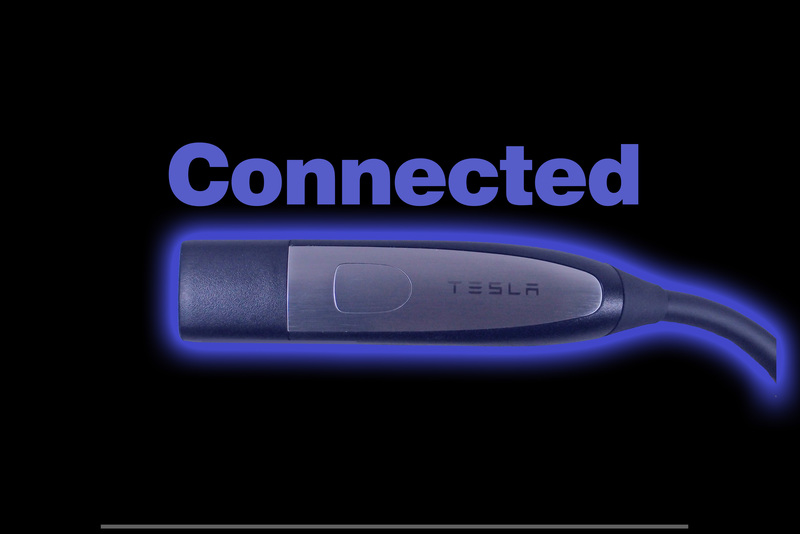 The mobile charger is off-hook, and assumed to be connected to the car. 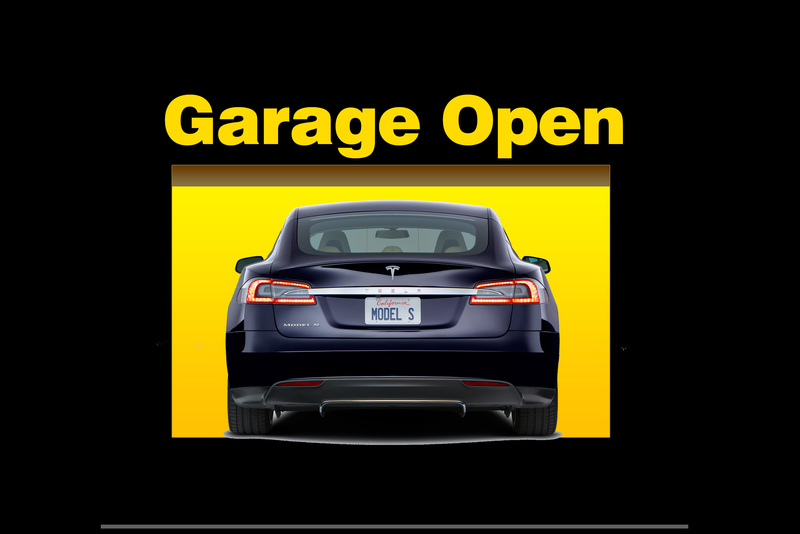 As a bonus, I elected to add an additional indicator when the garage door is left open. This project required some fairly simple low-voltage electrical work and soldering, quite a bit of mechanical work, a bit of scrounging for parts, and having some film positives made from jpgs for the 3 indicators, and access to a plug for the small transformer. If you elect to take on this project, you may want to simplify the project or skip entire portions. It also assumes you can run a set of wires from where you hang up the mobile charger to the location where you want to display the status, and have an outlet somewhere along the way. I used lots of connectors throughout, but this adds a bit more complexity and everything could be hard wired together instead. And of course you can modify the design any way you want. This shows how I elected to build it and hopefully give you some ideas for your own indicators. A box with hooks where the excess cable resides. 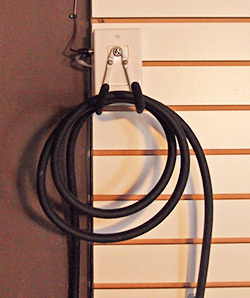 The hook is attached to a microswitch to identify if the cable is present or not. 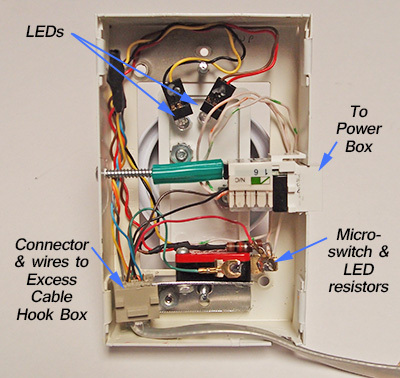 A second box has a bracket attached to a microswitch. It holds the cable connector end. 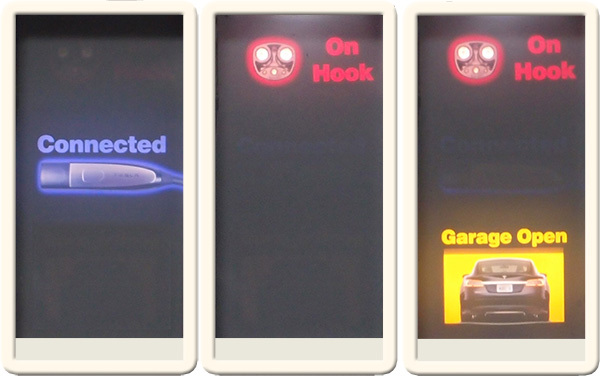 I added LEDs to show the state – on or off hook. The LEDs here are not necessary, but make it look cool. A transition box going into the garage wall, and splicing in the DC power. A box located inside the house to displays the status. 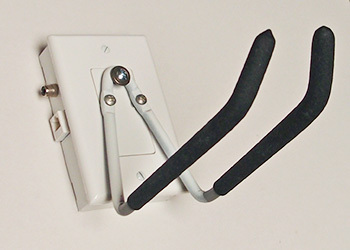 An alarm reed switch and magnet on the garage door detects if the door is open or closed (optional). This holds the cable, and has a switch to detect if the cable is not present (i.e. perhaps in the car). If you have the HPWC, then this box is not needed and the switch becomes a short to the NO position (i.e. 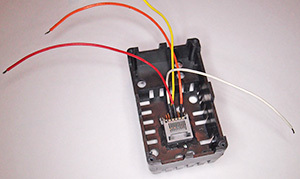 +VDC goes to the center arm of the connector switch). Cut the bottom off the blank adapter plate, and keep both parts. When mounted to the box, the top will act as a hinge and will hold the utility hanger. Drill three holes in the top adapter plate to hold the utility hook. While the utility hook only has two holes, we placed a third screw at the top just below the bend, held by a large washer. This is done so we can angle the hook out slightly to clear the faceplate when pressed. Create an aluminum plate that goes behind the adapter plate. I made three holes to align with the adapter plate (but smaller holes) and tapped the holes for the bolts. I used some double-stick foam to hold the aluminum plate to the back of the decora adapter plate. This extra work is done so once the entire assembly is put together, you can first mount the box to the wall, add the cover plate BEFORE the hook is attached, and then thread the bolts for the utility hook last. Inside the box, I cut a rectangular hole in the side for the CAT-3 jack. To hold the jack in place, drill a hole on the opposite side and use a plastic anchor and a long self-tapping metal screw. The anchor presses on the back of the CAT-3 jack to hold it in place. Make a small L bracket for the microswitch and attached it to the box, so that the decora adapter plate rests on the switch so any depression of the switch trips the microswitch. Optional – Drill another hole in the side for a RCA jack. 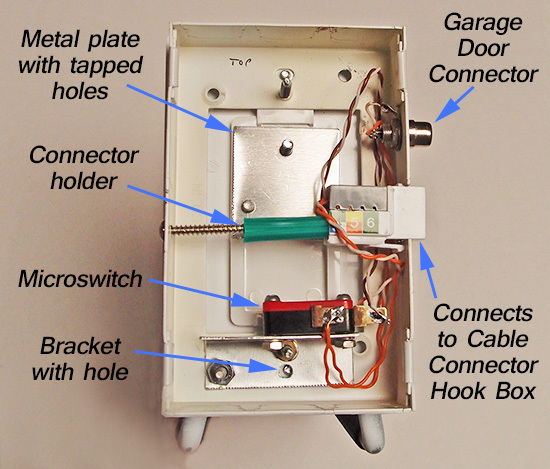 This is the connector to the garage door reed switch, so it can detect when the garage door is open. Electrically connect up the microswitch, the RCA jack and the CAT-3 connector. Before final mounting, do a test dry run that everything fits and the switch works as expected. Before mounting, you may want to test the entire system together to be sure it’s all working as planned. While the hook are only available in gray, I painted the gray portion white to match the rest of the box. I fully assembled the box to confirm a good fit and the switch works as expected. 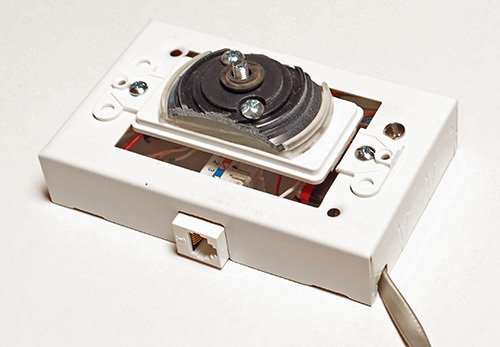 It requires some disassembly before it can be mounted, as the mounting screws are accessed from under the wall plate. Mount the metal box plate on the wall high, like my example, or low if your NEMA 6-50 is oriented downward. Attached the rest of the box to the box plate, attach the wallplate, and lastly the utility hook. I added some washers on the lower two holes between the hook and the decora plate so the hook does not bind up on the edge of the wall plate. 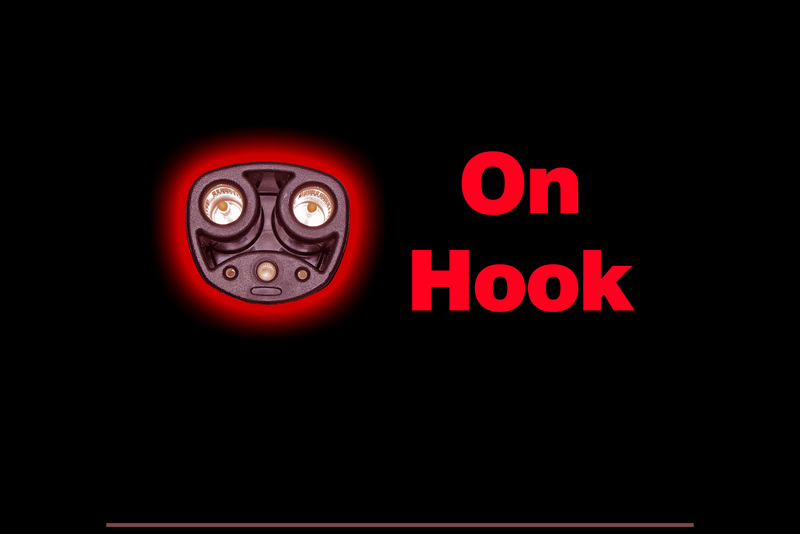 Test that a light down-pressure on the hook activates the switch properly. This box detects when charging connector is on the hook or not, and lights up either amber (on-hook) or green (off-hook). Cut the bottom off the blank adapter plate, and keep both parts. When mounted to the box, the top will act as a hinge and will hold the shower mount. Disassemble the shower mount and you will use both the screw mount and suction cup mount together. Drill holes through the black shower mounting bracket through the suction cup mount and into the center of the blank adapter plates. The holes in the blank adapter plate must be offset (see assembled image below to see how they are offset). Cut off the sides of the suction cup and black plastic plate so there is no overhang on the decora plate. This is necessary so the assembly will push in (pressing the microswitch) without binding on the wallplate. If your are including the optional LED indicators, I drilled two more holes for the 5mm LEDs near the top of the decora plate, but just below the edge of the suction cup. The idea is to light the clear suction cup so it illuminates around the edges. Cut or file off the tips of the LEDs (but not so much to damage the tiny wire inside the plastic that is just above the LED and very hard to see). No need to smooth the LED, as a rough top is better to distribute the light. Install the LEDs in the holes and epoxy in place so they are flush with the front. On the black portion of the shower mount that faces the LEDs, I painted white to better distribute the light. Similar to the Excess cable box, cut a rectangular hole in the side of the metal box for the CAT-3 jack. To hold the jack in place, drill a hole on the opposite side and use a plastic anchor and a long self-tapping metal screw. The anchor presses on the back of the CAT-3 jack to hold it in place. Make a small aluminum L bracket for the microswitch and attach it to the box, so that the decora adapter plate rests on the switch so any depression of the switch trips the microswitch. Electrically connect up the microswitch, the LEDs and resistors, the CAT-3 connector and a set of wires that connect to the Excess Cable Box’s CAT-3 connector. Instead of a hard-wire to the Excess Cable Box’s connector, I found a small CAT-3 connector with wires attached that I stuck inside the box. 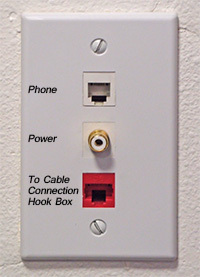 While it can’t be removed while the box is mounted, it did make it easier to create the cable between the two boxes with modular connectors at each end or you can use a standard 6-wire phone cord. Note that many phone cords only have 4-wires, which will not work in some situations. Before final mounting, do a test dry run that everything fits and the switch works as expected and doesn’t bind up. Again, you may want to test everything together before final mounting. Mount the metal box plate on the wall at an easy to reach height. Attached the rest of the box to the box plate, attach the wallplate. Put a thick rubber washer on the shower mount’s protruding bolt and screw on the white portion of the shower mount. Test that a light down-pressure on the shower hook activates the switch properly. If the shower mount prevents the switch from activating, you may need more rubber spacers so there is enough clearance. This optional box transitions from the garage to the house, and provides power to the system. In my system, it also has a phone jack for the garage, unrelated to this project. Note that I used CAT-5 connectors (8-pins) in a few places, but there is no need to go beyond CA-3 (6-pins). I was already using a 24 VDC transformer to power another built-in, and had used an RCA jack as the connector. This is somewhat non-standard, and a 12 VDC transformers are more commonly available, and RCA jacks are not normally used for power. It’s also hard to find a DC power connector as part of a pre-made modular insert. You could go with the RCA approach or get a matching receptacle for the power supply connector you are using and install it into a blank modular insert. It could also be hard wired in. Cut a hole in the drywall for the electrical box, feed the wires from the hole to where the display box will be, and feed the wires into the box and attach the box to the wall. Wire up the connections to the CAT-3 and power. I did quote a bit of testing before sealing it all up. The slides are made from 3 JPEGs and turned into color transparencies. I used Gamatech to make the 35mm slides from the jpgs. It cost about $12. When ordering, be sure to specify that you do NOT want the slides mounted into frames. There is a dark line on the bottom that you cut off. It helps keep the sizing correct when the transparencies are made so it is not auto-sized incorrectly. I’m not sure you can get the dimmer specified, it was something I had laying around. 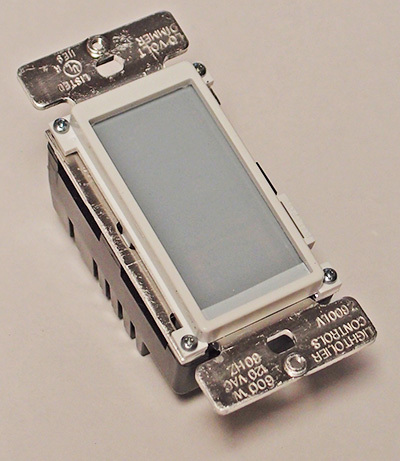 It’s only used to provide a housing and make it work with a standard decora style faceplate. A quick Google search didn’t find this exact part. There are many other ways to build this, so you may have to substitute other parts and approaches with the parts you obtain. I took the slide dimmer apart and tossed the guts and the plastic slide. Don’t lose the tiny screws, as we’ll need them at the end. The top plastic frame is perfect to hold the indicator panel. I used a power scroll saw to cut the following plastic panel parts. The panel is made up of 1/16″ clear acrylic cut to fit, where I left on the white “peel off” protective coating on the back side to give it a “white” look when nothing is indicated. Below that are the 3 color transparencies, with a couple of slivers of black tape to hold them together into one sheet. Below that is a 1/8″ clear plastic, and below that is a 1/16 translucent diffuser. This all fits nicely between the dimmer’s top plastic frame and the dimmer’s metal mounting plate. You’ll also need to cut the metal plate to let light though. It ended up looking like a “C” with it open on one long side. In the plastic back of the dimmer, cut a square hole in the bottom for the PC mount CAT-3 connector. I soldered on four different colored wires to 4 pins (see schematic). I then inserted the CAT-3 connector and epoxied it into place. I took a perf-board and cut it to size to fit within the dimmer box. With the LED strips, there are normally 3 LEDs and one resistor every 2 inches. I cut out two LEDs and the resistor between them. Remove the back adhesive and place the three strips on the perf-board centered below the corresponding slide transparency to be lit. Each gets a second resistor when wiring it all up. I also had some 8-pin strip resistors that I soldered between each section to hold some thin black plastic to isolate each light. They are not electrically attached to anything. I’m sure there are may alternative ways of doing this. Wire up the board to the four wires from the connector. Now the module can be fully assembled and screwed together. 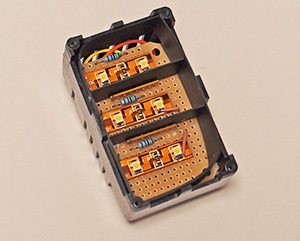 The module can then be installed inside the house in an electrical box, old-work, and connected to the cable that goes to the Power Box. I mounted the switch so the magnet is in proximity to the switch when the door is closed, so that the contact is open. The two wires then ran to an RCA plug that connects to the jack installed in the side of the Excess Cable Box. The project went quite slowly, since I was designing how it would work and taking photos. Your effort will be far faster, but will still be quit a bit of work to complete this project. I was a fun DIY project, and I’m very happy with the results. I’m still not sure about the best colors to use for the transparencies and the hook box. Right now they are not consistent – I used green LEDs for the hook box and a blue “Connected” transparency. I also used a Amber LED in the hook box that relates to the red “On Hook” transparency. I made the transparencies after building the hook box, and liked the red/blue look better in the display module, and likely should have used the same colors at the hook box. I used quite a number of connectors, which made it easy to test. The downside is it added a lot more work to get the wiring right and make all the connections. In hindsight I’d avoid most of the connectors and hard-wire it. I don’t expect any parts will go bad, as the electrical design is quite simple.